1 What is a resistance measurement? 2 How do I perform a resistance measurement? What is a resistance measurement? 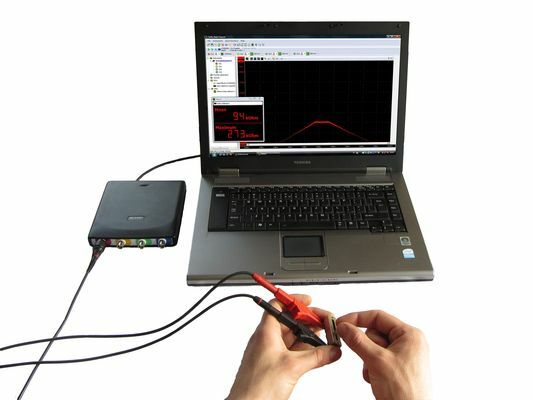 The resistance measurement of a TiePie oscilloscope like the Handyscope HS6 DIFF or Handyscope HS5 can be used to measure a constant of variable resistance. In contrast to the resistance measurement of a multi meter, the resistance measurement of a TiePie oscilloscope is fast enough to measure a potentiometer, so that the complete carbon track can be checked. How do I perform a resistance measurement? A resistance measurement is easily performed with the file that can be downloaded here. Perform a oneshot measurement while holding the measurement probes or 4mm plugs against each other. In the right mouse button menu of the Gain/Offset I/O click on Neutralize. The resistance measurement can be performed by clicking on the start button or use the hotkey S. See figure 1 for a performed resistance measurement. With a lab scope an acceleration pedal position sensor is measured with the key turned on and no running engine. The signal from the sensor is shown and can be downloaded. To help determining whether an acceleration pedal position sensor is functioning correctly, different possible deviations from the example signal are mentioned along with probable causes. With a lab scope a throttle valve position sensor is measured with the key turned on and no running engine. The signal from the sensor is shown and can be downloaded. To help determining whether a throttle valve position sensor is functioning correctly, different possible deviations from the example signal are mentioned along with probable causes. With a lab scope a throttle valve position sensor is measured with the key turned on and engine off. The signal from the sensor is shown and can be downloaded. To help determining whether a throttle valve position sensor is functioning correctly, different possible deviations from the example signal are mentioned along with possible causes.